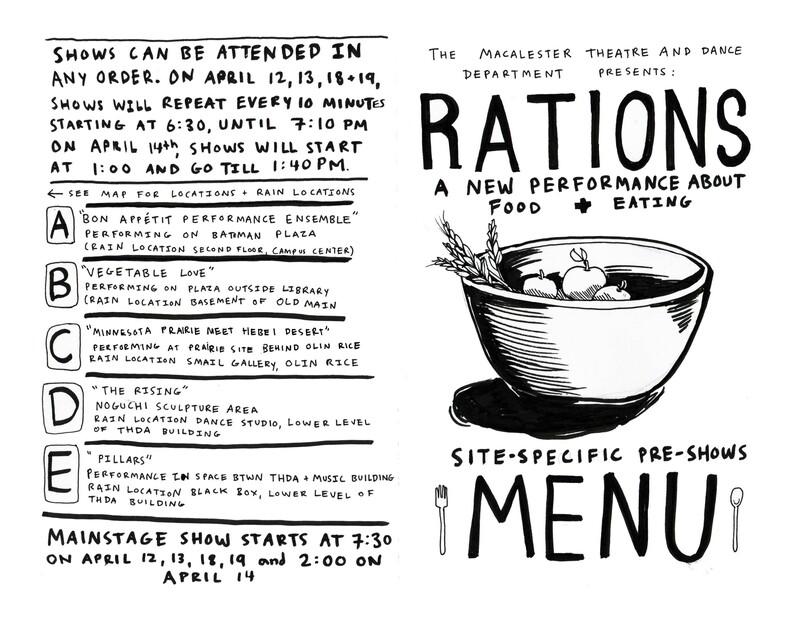 St. Paul, Minn. – The Macalester College Theatre and Dance Department presents RATIONS: A New Performance about Food and Eating, in site-specific locations around the campus and in the Janet Wallace Fine Arts Center on the Mainstage Theatre, 1600 Grand Ave., St. Paul, Minn. Site specific performances will begin at 6:30 p.m. and move to the Mainstage at 7:30 p.m. on April 12, 13, 18, and 19; site specific performances begin at 1 p.m. and move to the Mainstage at 2 p.m. on April 14. All performances are free. For more information, call 651-696-6359. RATIONS is a performance assemblage of many interrelated histories. It juxtaposes original writing about a range of local topics – table-settings, family foods, cooking, eating disorders – with global concerns and statistics about food production, labor conditions, and war rations. 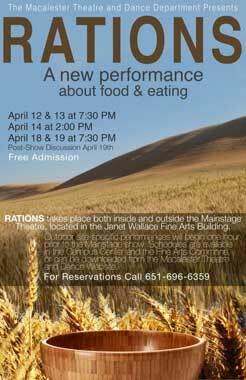 Its materials are poems, assembly-line images, research into tall grass prairie restoration and bread baking. RATIONS considers the human as well as the non-human, and asserts that we are always assemblages of both, as we take in and digest and reformulate ourselves and the material world. RATIONS is the third major on-campus event dedicated to issues of food during the 2012-13 academic year. The first was the International Roundtable in October, “Feeding the World,” and the second was the American Studies Annual Conference in February, “Alternatives in a Changing Food World.” RATIONS extends the campus’ inquiry into food – justice, production, consumption, waste, scarcity – through the artistic languages of performance: movement, image, scene, and a critical/aesthetic engagement with ideas and issues. The production is a devised work for the stage, meaning its participants have co-created the piece through reading, discussion, movement experimentation, and original writing. The 26-member ensemble brings students trained as actors and dancers together, exploring shared vocabularies and concerns. 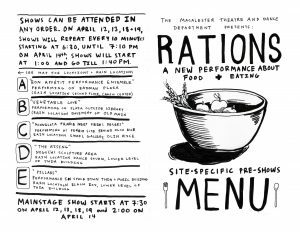 Marking the 50th anniversary of the Bread and Puppet Theatre, RATIONS begins with small-cast outdoor performances playing continuously for 50 minutes ahead of each indoor Mainstage performance. Audiences may go in any order through five outdoor shows, each six minutes long. 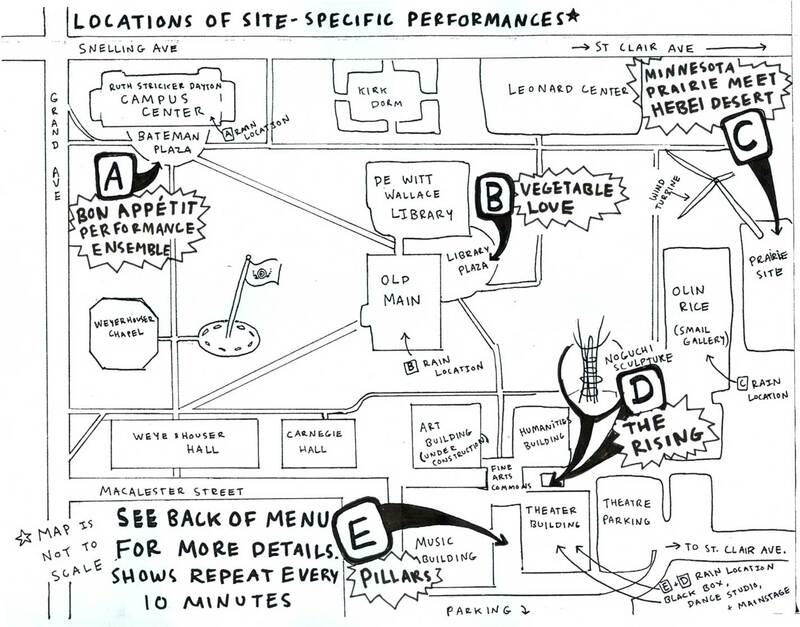 The outdoor performances are: the Bon Appetit Performance Ensemble, performing on Bateman Plaza (rain location is the second floor of the Campus Center); Vegetable Love, performing on the plaza outside DeWitt Wallace Library (rain location is the basement of Old Main); Minnesota Prairie Meet Hebei Desert, performing at the prairie site behind Olin Rice (rain location is Smail Gallery, first floor of Olin Rice); The Rising, performing at the Noguchi Sculpture area (rain location is the Dance Studio in the lower level of the Theatre and Dance building); and Pillars, performing in the space between the Theatre and Dance and the Music building (rain location is the Black Box in the lower level of the Theatre and Dance building). The performers and the audience meet in the Janet Wallace Mainstage Theater for the onstage performance, which lasts about 60 minutes. 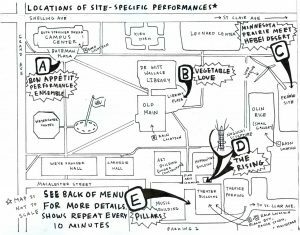 Schedules and maps for the outdoor site-specific performances can be downloaded from the Macalester Theatre and Dance website, or picked up from the Campus Center or Fine Arts Commons lobby. Wynn Fricke, award-winning Twin Cities choreographer and director of Macalester’s Dance Program, and Beth Cleary, theatre director and department chair, have been the principal collaborators on the project. Other professional collaborators include Twin Cities composer and sound designer Michael Croswell, and scenic/lighting designer Thomas C. Barrett, Macalester’s Technical Director and a member of the teaching faculty. Lynn Farrington, whose costumes have been seen on local and national stages for many decades, heads the costume work, joined by local puppeteer and props designer Maria McNamara. A post-show discussion, moderated by Theatre and Dance Professor Lara D. Nielsen, will follow the final performance on April 19. Panelists are: Professor Catherine Ming T’ien Duffly ‘00, Reed College Theatre Department; Professor Craig Upright, MNSCU-Winona Sociology Department; Hui Niu Wilcox, St. Catherine University’s Sociology Department and member of Ananya Dance Theatre, Minneapolis. The RATIONS cast includes Amy Maxon ’13, Verona, Wis., Caroline Davidson ’13, Lexington, Mass., Cassidy Foust ’15, Watertown, Wis., Emily Sylvestre ’16, Minneapolis, Minn., Jon Dahl ’14, Roseau, Minn., Julia Davidson ‘13 from Lawrence, Kan., Kyoko Sakai ’16, Tokya, Japan, Liana Violet Ray ’16, New York, N.Y., Sophie Keane ’16, Columbia, Md., Alex Yang ’13, Ambler, Penn., Brigid Warnke ’13, Long Beach, Calif., Camille Kasavan ’14, Forest Hills, N.Y., Ceren Kaysadi ’14, Instanbul, Turkey, Emily Gustafson ’16, Minneapolis, Minn., Jenny Liu ’13, Suzhou, China, Laura Humes ’16, Shoreline, Wash., Megan Renslow ’15, Moorhead, Minn., Rebecca A. Murtha ’16, Silver Spring, Md., Robert Gelberg ’14, North Caldwell, N.J., Ryan Brownlow ’14, Benbrook, Texas, Zoe Rodine ’13, San Jose, Calif., and Jamie Howell ’14 (St. Thomas University), Champlin, Minn.